Round 12 has started in sensational fashion with two cracking games. Tonight it was the Crows who held on to win by 4 points after leading by 31 points at three quarter time. GOAL SAINTSMontagna slots it through but it will be a case of what if for St Kilda with the Crows recording a 4 point win. Montagna marks, but the siren sounds so this shot will be purely academic with the Crows holding on to win. Just ten points the difference with 2:45 remaining. The Saints are a real threat to pinch this. Sanderson is going nuts in the box! GOAL SAINTSMilne receives from Steven and snaps it over his shoulder for his second in a minute. GOAL SAINTSMilne marks and rushes back to take the kick quickly. He lines it up and it just carries. Saints still in the match but need to be good. Just under 4 minutes remains. BEHIND CROWSvan Berlo marks it inside 50 but his shot is a little wayward and through for a behind. GOAL SAINTSSiposs roves the pack with Riewoldt unable to take the mark. From close range his snap is a good one. BEHIND CROWSSome quick ball movement sees Walker in position A to take the mark. His shot at goal looks good off the boot but moves at the last moment to hit the post. BEHIND CROWSMackay runs to 50, shrugs off the tackle and regains his balance. He steadies and kicks, but misses way to the right. GOAL CROWSTippett in a two on one against him and he comes out with the free kick. From 40 metres out it goes through post high. That could almost be the ball game for the Crows. BEHIND SAINTSArmitage chips it across to Steven who plays on and kicks straight, but it's touched off the boot. BEHIND CROWSPetrenko handballs to Tippett who snaps over his shoulder and misses. BEHIND SAINTSThe Crows defenders are officially under the pump and they rush it through as they attempt to weather the storm. BEHIND SAINTSSchneider handballs inside to Milne who is off. He steadies and misses a sitter from 30 metres out. Crows lead now only 21 points. There is plenty of time left. GOAL SAINTSRiewoldt marks it just outside the square. He plays on and keeps it low for his second. Jenkins has been subbed out for Knights for the Crows. GOAL SAINTSDal Santo runs inside 50. He goes long, it bounces and bounces and bounces through for his second goal of the night. Saints stay in touch. BEHIND CROWSWalker takes another mark inside 50. From 40 metres out you would expect him to kick it, but he doesn't. BEHIND CROWSWalker marks but his resulting shot hits the post. The siren sounds for three quarter time with the Crows in control. They lead by 31 points and look likely to take the points. BEHIND SAINTSSiposs tries one from distance, but he can't straighten it up and it's through for a behind. GOAL CROWSWright is thrown as he kicks it but it doesn't matter. He'll be right! The kick comes around perfectly for another Crows goal. Crows all of a sudden lead by 32 points. GOAL CROWSThompson gets himself into trouble. Then ducks his head and gets out of trouble before kicking it through for a goal. BEHIND SAINTSTalia punches it through for a rushed behind. BEHIND SAINTSMilne sees Armitage out of the corner of his eye and handballs to him. 15 metres out he shouldn't miss but he does as he is bumped as he kicks it. BEHIND SAINTSRiewoldt marks and passes to Gram whose shot drifts across the face of goals for a behind. The Crows lead by 23 points and look to have the Saints' measure at the moment. GOAL SAINTSRiewoldt comes out and takes a very good contested mark. He goes back and kicks a captain's goal. He has been off tonight and needs to lift if his team are to win. BEHIND CROWSThe St Kilda defence rushes the ball through under enormous pressure. GOAL CROWSCallinan is beginning to make a name for himself in this AFL caper. He uses his pace to get there first, snap over his shoulder and kick a ripping goal. Blake has been subbed off with Geary coming on. GOAL CROWSJacobs, the Big Friendly Giant, is there as Jones' handball goes astray. He throws it onto his boot and it floats through for a goal. A good one at that too. GOAL SAINTSArmitage is paid the free kick for holding the ball and he slots it through despite Crows fans' best efforts to distract him. GOAL CROWSTippett is the man in front and as the kick falls short he is in prime position to mark it and he does. He slots through the goal from 20 metres out and he has four. The siren sounds for halftime with the Crows leading by 16 points. This match is not over by any stretch of the hamstring so do not miss out on the second half. BEHIND CROWSWright runs in from 35 metres out and misses to the right. GOAL SAINTSSchneider marks and is paid 50 for an infringement over the mark. From straight in front Schneider won't miss and he doesn't miss. GOAL CROWSPetrenko goes in to do all the dirty work and he gets it out to Walker who snares it with the outside of his boot! BEHIND SAINTSMilne tries one from 55 metres out with a vacant goal square, but his shot bounces the wrong way. BEHIND CROWSThe long kick forward by the Crows is off hands and through for a behind. GOAL SAINTSSchneider runs in, takes a couple of bounces and kicks the goal from the square. Saints stay in touch. GOAL CROWSCrows win a very quick centre clearance with Callinan reading the crumbs off Tippett and snapping it through for a beautiful goal! GOAL CROWSCallinan marks it 45 metres out. He chips it to Wright in the square and it was the right choice. Wright was at the right place at the right time for the right result. BEHIND SAINTSMilne is held in the marking contest and is paid the free kick 35 metres out directly in front. He is not great from the set shot and this one misses to the right. GOAL SAINTSSiposs has it on the 50. He steadies and measure and sends it straight through the middle. The Saints are really closing in BIG TIME! BEHIND CROWSThe Adelaide defence rushes the ball through for a behind under pressure. BEHIND SAINTSGoddard with an opportunity to seize the moment. He normally eats these for breakfast but it appears as though he is in a hurry and he skips breakfast! GOAL SAINTSMontagna runs into space and the footy follows him. From 35 metres out and running at full tilt Montagna kicks the goal. The Saints are now officially back in touch. The Saints look like they are slowly getting back into the match. Funny thing to say but the Crows may need a steadier. GOAL SAINTSNick Dal Santo is more like Nick Dal Santa Clause with a kick like that - he delivers the goods. He takes it from outside 50 and the goal umpire moves out of the way. Great goal. GOAL CROWSThe Crows handball it around the forward line after Jacobs' up and under kick. Enter Jason Porplyzia and bang! He has three goals. The Man is back! Big time! GOAL CROWSJason Porplyzia continues to please ya! He marks it down low and from 20 metres out he kicks his second goal. Crows lead by 24 points. 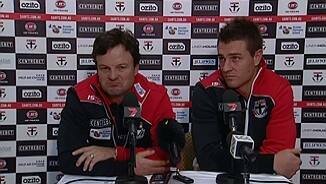 BEHIND SAINTSRiewoldt marks it and it's quite gettable for the Saints Skipper. He lines up to a chorus of boos and the kick is a shocker. BEHIND SAINTSKoschitze receives from Schneider and he misses a relatively gettable shot from 25 metres out. BEHIND CROWSTippett is in good form tonight and he takes another one out mark. This time the kick is disappointing. GOAL CROWSPorplyzia is here to please ya and please ya is exactly what he does! He marks out in front of Walker and slots it through with the goal umpiring sticking up two! It's poetry in motion. The siren sounds to end the first quarter with the Crows leading by 14 points at quarter time. GOAL SAINTSSchneider handballs over to Goddard who snaps it brilliantly from 25 metres out. A productive first quarter by the Crows sees them lead by 20 points with 2 minutes and change remaining. GOAL CROWSWelcome to the Kurt Tippett show. In this episode he takes a good strong overhead grab and confidently walks up to kick his third goal. Don't miss it! GOAL CROWSTippett takes a spectacular mark for the Crows. He goes back and caps it off with his second goal. He looks destined for a big night. BEHIND CROWSSloane's long effort is punched through for another Adelaide behind. BEHIND CROWSGwilt steps over the goal line to concede a rushed behind. Adelaide lead this tight contest by 6 points in front of a big Friday Night Footy crowd. GOAL CROWSWalker, Adelaide's great big mullet marks on the lead. From the 50 he goes back and kicks a very good goal. He is as good a kick going around at the moment. GOAL SAINTSDal Santo passes to Milne who marks and cops one to go on with. He runs off the mark and snaps it through to level the scores. BEHIND SAINTSMilera tries one from distance, but he misses to the left. GOAL SAINTSKoschitzke is unable to take the mark. At the fall of the pack is Steven who reads it like a book. He takes it and runs in to kick the goal. GOAL CROWSMackay marks it on the 50. He goes back and slams it straight through the middle from 55 metres out. What a beauty! 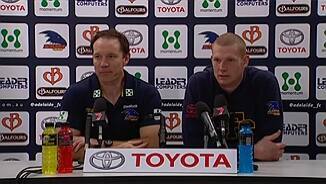 Crows have made a terrific start. Adelaide continue their strong clearance work with 3 early clearances to nil. GOAL CROWSTippett is held in the marking contest and is paid the free kick. From the set shot Tippett goes BANG and kicks it straight through. BEHIND CROWSAdelaide win the first centre clearance and burst through. The ballis moved quickly with Tippett taking the mark. His shot misses to the right. The substitute for Adelaide is Knights whilst St Kilda's bench warmer will be Geary. The Saints have made one late change with Saad being replaced by Geary. Good evening and welcome to AAMI Stadium for Adelaide v St Kilda.